Jim Morrison has spent most of his life collecting and preserving the history of Christmas. A gentle man with a gentle nature and a deep love of Christmas past as seen through the eyes of a child, Jim is a true treasure. An expert on Christmas past, his National Christmas Center houses some of the most priceless Christmas treasures ever brought to light and is a must see to all who truly love Christmas. From Tudor Towne to the North Pole to the Nativity, visitors are able to see things and experience exhibits that truly capture the Christmas Spirit as a child would see it. Be assured that every visitor is made welcome by “Santa Jr.” Jim has been seen in countless publications and in documentaries. 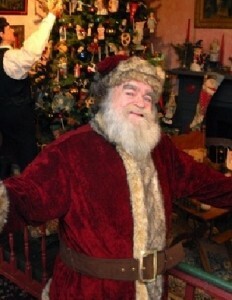 He has been seen in Christmas specials on both the History Channel and the Travel Channel. He was the 2012 recipient of the â€œThrough The Eyes of a Childâ€ award. Jim Morrison truly is the embodiment of the true Spirit of Santa Claus.